200 East 3rd Street, Big Spring, Howard Co. Many in Big Spring had given up on ever seeing this grand hotel brought back to life, and some had actively sought its demolition; today citizens and city leaders celebrate the return of this landmark to the center of Big Spring life. Completed in 1930 the hotel was tallest building between El Paso and Fort Worth at the time. During its 50 years of operation it served as a social and business hub, hosting famous guest such as Elvis Presley, Lawrence Welk and President Hoover. The Settles Pharmacy and The Settles Grill at street level were an important part of Big Spring life and served the community and guests alike. When the restoration project began, the Hotel Settles had been abandoned for thirty years. Previous restoration efforts had resulted in stripping valuable parts of the hotel and selling them. Many historic features were missing. In addition, roof leaks had damaged the plaster and comprised the intricate detailing. Undaunted, the owner and his team took painstaking effort to preserve what historic fabric remained and to install new construction that was consistent with historic conditions as confirmed by original construction drawings and careful examination of remaining historic material. 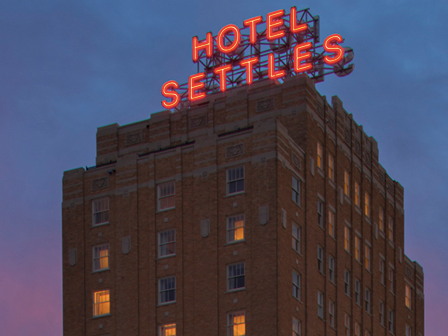 The Hotel Settles reopened in 2013 with a full-service restaurant, salon and spa, and is serving as a catalyst for downtown revival in Big Spring and an example for other abandoned oil boom hotels across Texas.